Parents ask me all the time – Why are oboe reeds so expensive? I can’t blame them for asking that question. Oboe reeds are really expensive, especially when you are comparing them to clarinet or saxophone reeds. So – why are oboe reeds so expensive? As with any product, a number of factors go in to the pricing of an item. Supply and demand is one reason. There are much fewer oboe players than clarinet and saxophone players. Fewer players means less sales which means more cost for the manufacturer and more cost to you. Another reason is the reeds are very time-consuming to make. 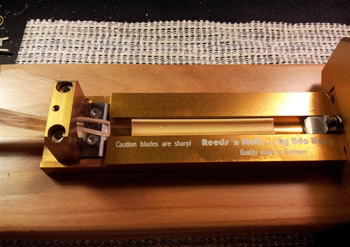 Even machine made oboe reeds will still take longer to make than clarinet or saxophone reeds. Cost to make, time and money invested, consumer demand all figures into the price. I wanted to give parents and students alike more of what really goes on behind the scenes for the reedmaking process. 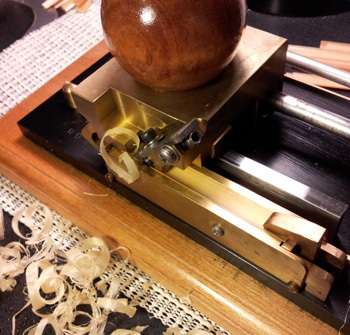 There are lots of blogs, books and videos about how to make oboe reeds but they all start with once the cane is in the final processing stage in order for you to tie it on to become a reed. 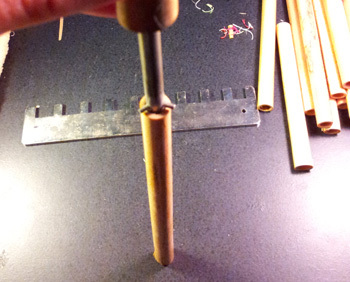 I want to show you all the other steps involved before the cane gets to the point of being ready to become a reed. What happens first? Where to begin? First off, let me tell you a little about the cane. Oboe, bassoon, clarinet, saxophone, bagpipes and any other instrument who plays with a reed uses a type of cane called Arundo Donax. It grows in damp soil so it is often found near a water supply. While Arundo Donax may resemble bamboo, it is only very distantly related. This cane grows in many places throughout the world including the United States, France and Argentina. The reed plant grows very fast and can grow up to 30 feet tall. It has nodes which resemble sections segmented like bamboo. 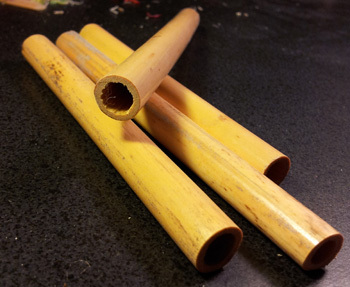 Cane is ordered from a reputable supplier of reed products. Now this is the behind the scenes reedmaking of what professional players go through to make their reeds. This part of the process requires expensive tools and machines. It is not cost-effective or time efficient for the younger student player. 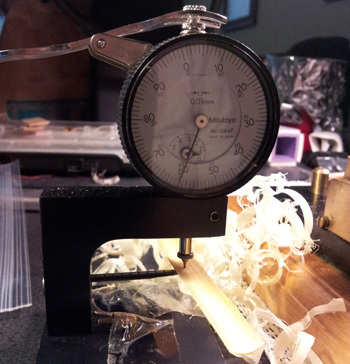 Please note: This guide is by no means an in-depth how-to, but a short overview of the process of taking tube cane to gouged, shaped and folded oboe cane. 1. Cane arrives in tubes from the supplier. Check the tubes for straightness and discard warped cane. 2. 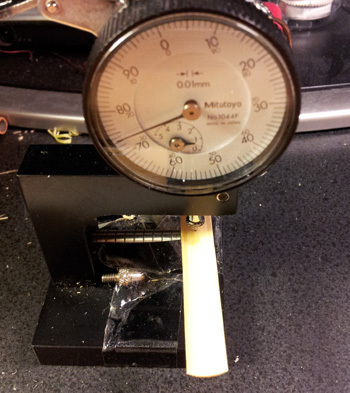 Check the cane for the desired diameter using a gauge. 3. Split the cane using a splitting tool. 4. 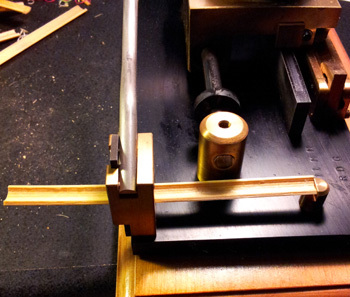 Guillotine the split cane to get it to the correct length. Check each piece for straightness. Discard any warped pieces. 5. Pre-gouge the cane to trim the sides and take out more of the inside of the cane. 6. Use a micrometer to make sure the pregouger took out an appropriate amount of cane. 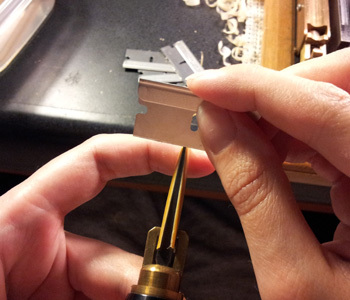 Discard any pieces which have come through the pregouger too thin. 7. Soak the cane for 30 minutes and once that is done, begin the gouging process. 8. Use the micrometer again to measure the cane. Gouged cane that is too heavy or too thin is not usable. Check for straightness again using a flat surface. Measure using a radius gauge to insure the appropriate curve with the cane. Discard any unusable pieces. 9. Once the cane is gouged, score it down the center using an easel. Fold the cane on the score to prepare for shaping using a shaping tip. Secure the cane on the shaper tip. 10. Follow along the shaper tip with the razor blade. Release the cane from the shaper handle. Now you have cane ready to be tied on to become happy oboe reeds! 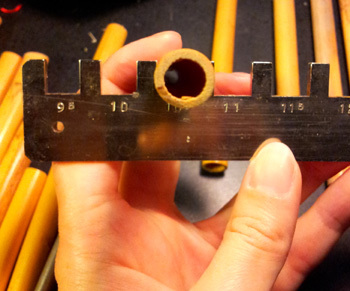 I hope that parents, students and enthusiasts who will come across this posting will have a somewhat better understanding of why oboe reeds are so expensive. As you will be able to see in this post and the other posts to follow – it is a time-consuming process and an art all its own. 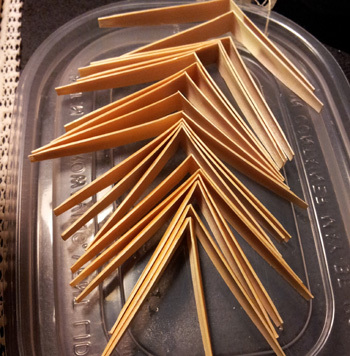 Gallery | This entry was posted in Education, Oboe Reed Making and tagged Arundo Donax, clarinet, learn to make oboe reeds, make your own oboe reeds, oboe, oboe reed making, oboe reeds, Reed. Bookmark the permalink.